Waves of Creativity: Rain or Shine? A quick post today with my Journal52 piece for week 14. The prompt is Rain or Shine - what sort of weather do you like. 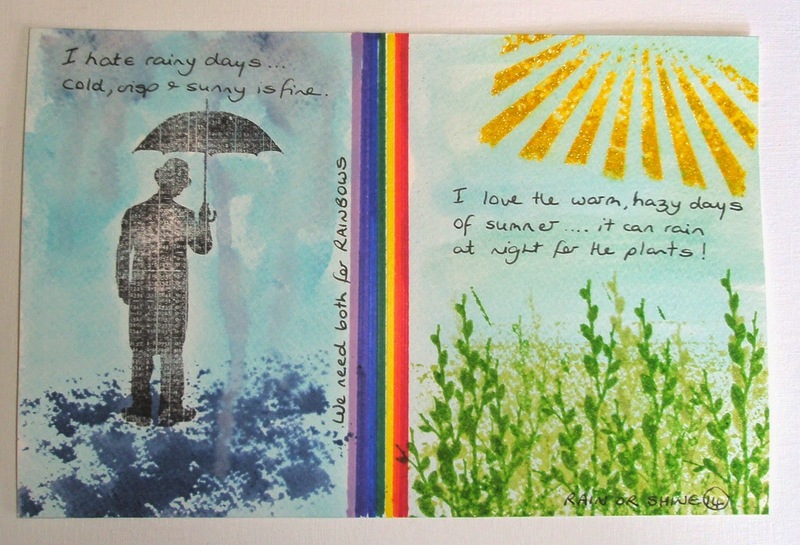 I've done a rainy side with Brolly Man and a sunny side with Sun Rays and greenery. I've just hand drawn a rainbow using Sharpies. I don't like rain, but thunder and lightening and snow are all good as long as I'm inside looking out!! The plants need the rain but why can't it always rain at night and be lovely and sunny during the day!! Guess we are never satisfied ....or stop talking about it!! Hi,beautiful work,I like your rain day!! !